Wycombe's automatic promotion hopes were dealt a severe blow after Paul Mullin struck to earn Morecambe a win. 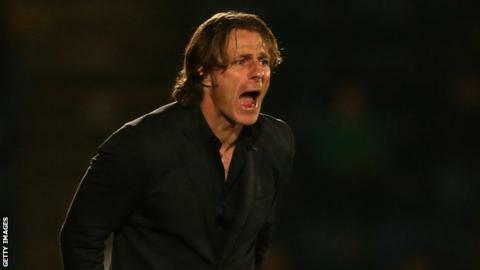 Gareth Ainsworth's men started the day in third but after Southend and Bury both won they will head into the final day of the season in fifth place. Morecambe were the better team with Wycombe goalkeeper Matt Ingram impressing but he could do nothing about Mullin's header after 86 minutes. Wycombe must beat Northampton on the final day, hoping their rivals slip up. "I'm really pleased with the defending today. Matt Ingram was incredible. If somebody was watching today, I might have lost him to a Premier League side. "There's not as much pressure as last season, but again we find ourselves on the last game of the season where we're looking at two different results - but it's been in a good way this year. "I'm so proud of the players this season, and to the fans can I say 'thank you'. I was choked up walking around at the end. They were brilliant. They know what we've been through. "We're still a club that's growing, that's just turned round in one season. To go up would have been fantastic and we can still achieve that. I'm really looking forward to next week's game. We will be going out to win that." Match ends, Wycombe Wanderers 0, Morecambe 1. Second Half ends, Wycombe Wanderers 0, Morecambe 1. Attempt missed. Aaron Wildig (Morecambe) left footed shot from outside the box is too high. Foul by Fred Onyedinma (Wycombe Wanderers). Laurence Wilson (Morecambe) wins a free kick on the right wing. Fred Onyedinma (Wycombe Wanderers) wins a free kick in the defensive half. Foul by Laurence Wilson (Morecambe). Goal! Wycombe Wanderers 0, Morecambe 1. Paul Mullin (Morecambe) header from the centre of the box to the top right corner. Assisted by Kevin Ellison. Matt Bloomfield (Wycombe Wanderers) is shown the yellow card. Foul by Alfie Mawson (Wycombe Wanderers). Paul Mullin (Morecambe) wins a free kick in the attacking half. Andy Parrish (Morecambe) wins a free kick in the attacking half. Aaron Holloway (Wycombe Wanderers) is shown the yellow card. Corner, Wycombe Wanderers. Conceded by Laurence Wilson. Attempt saved. Paul Mullin (Morecambe) left footed shot from the left side of the box is saved in the bottom right corner. Attempt saved. Hogan Ephraim (Wycombe Wanderers) header from the centre of the box is saved in the centre of the goal. Substitution, Wycombe Wanderers. Aaron Holloway replaces Steven Craig. Corner, Morecambe. Conceded by Matt Ingram. Attempt saved. Kevin Ellison (Morecambe) header from the centre of the box is saved in the top centre of the goal. Attempt saved. Padraig Amond (Morecambe) header from the centre of the box is saved in the top right corner. Attempt missed. Alex Kenyon (Morecambe) header from the centre of the box is too high following a corner. Attempt saved. Alex Kenyon (Morecambe) header from the centre of the box is saved in the bottom right corner. Corner, Morecambe. Conceded by Alfie Mawson. Attempt blocked. Jamie Devitt (Morecambe) right footed shot from outside the box is blocked. Alfie Mawson (Wycombe Wanderers) wins a free kick in the defensive half. Substitution, Wycombe Wanderers. Hogan Ephraim replaces Max Kretzschmar. Attempt saved. Alex Kenyon (Morecambe) right footed shot from the centre of the box is saved in the centre of the goal. Corner, Morecambe. Conceded by Steven Craig. Attempt blocked. Nico Yennaris (Wycombe Wanderers) right footed shot from outside the box is blocked. Andy Parrish (Morecambe) is shown the yellow card. Fred Onyedinma (Wycombe Wanderers) wins a free kick in the attacking half.